May has been much cooler month than normal, it's been quite windy but there hasn't been much rain. The Long Shady Border laughed off the vagaries of the weather and went ahead and put on lots of growth during the month, making it extremely lush, as you can see above. At the shadiest end in the Damson Border, the new growth on the Damson has made it a bit top heavy, not helped by all the wind. So I need to prune this, in part to stop branches from snapping off, but also to give it a bit more form. There are quite a few infant damson fruits developing, so I need to be careful not to chop these off. Underneath, the Pulmonaria has nearly gone over and needs to be chopped back. This will encourage new leaves to develop over summer/autumn, so that they will good next winter. I was surprised to find that some ramsons that I had planted last year have in fact come up and are flowering - if you look carefully you can see the white speck above. They are few in number and need to bulk up more before I can start harvesting them for pesto. In the Long Shady Border proper, the shadier end is very lush indeed. In fact, I think I may have over planted. 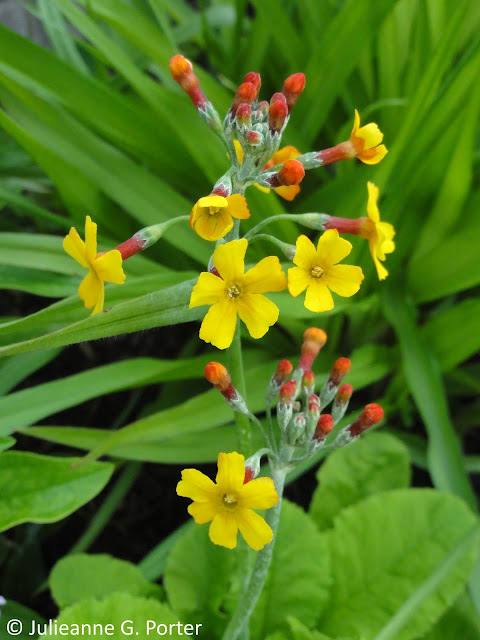 It's so hard to get right, because when you put them in the ground the plants are often quite small and there is much bare earth So even though I thought I was spacing them out enough, clearly it's a little congested. 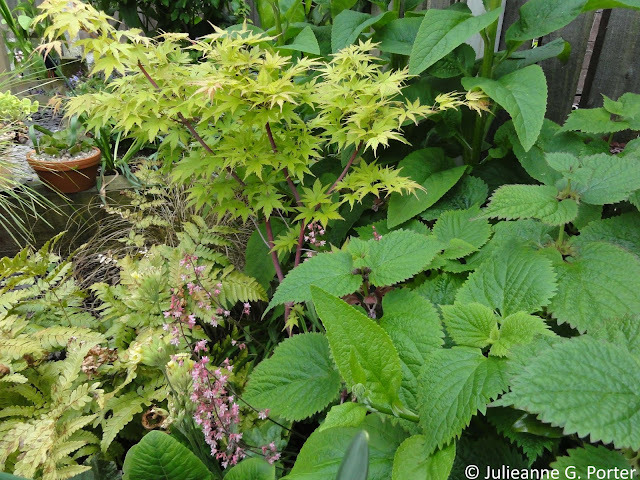 Acer palmatum 'Sango-kaku' is looking very healthy after almost dying from being in the Bog Garden last year. 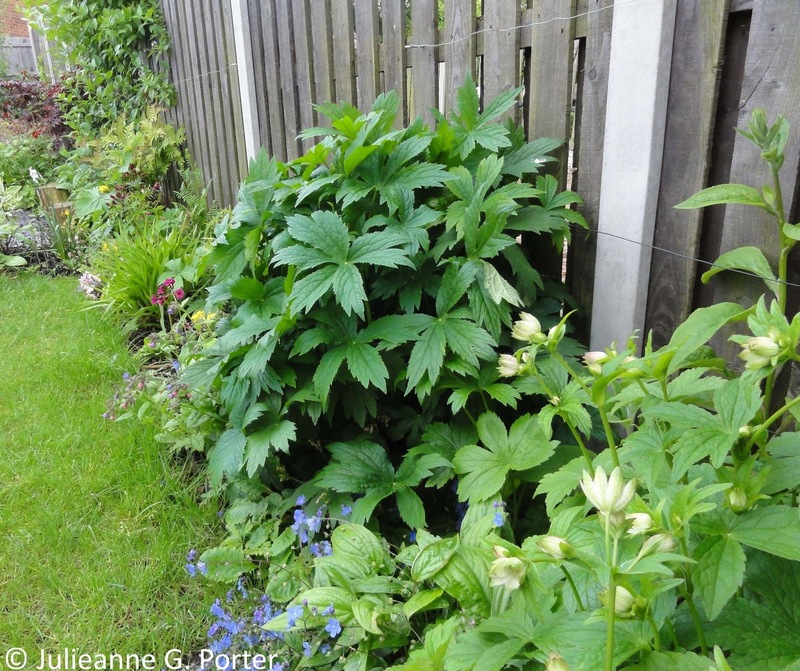 This is one of Kevin's two plants in the garden and he is a little protective of it and feels that the Digitalis behind it are crowding it rather too much. So I'm going to tie them back toward the fence to give it a bit of space. I need to keep my master digger happy. Plus, he is right. 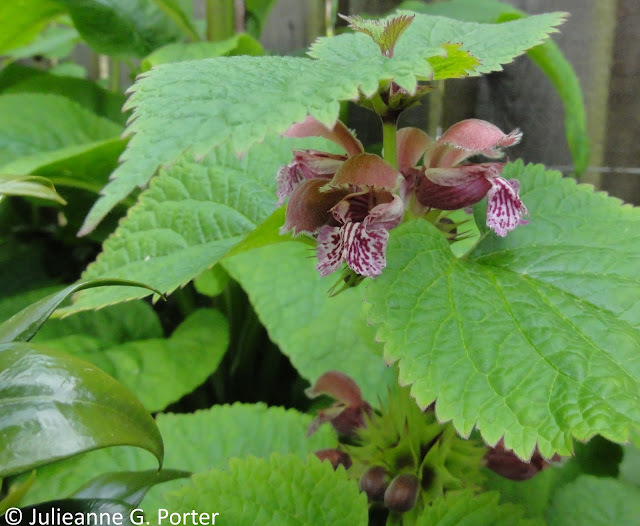 The Lamium orvala has also grown into a rather large plant and is swamping the Sarcococca confusa. 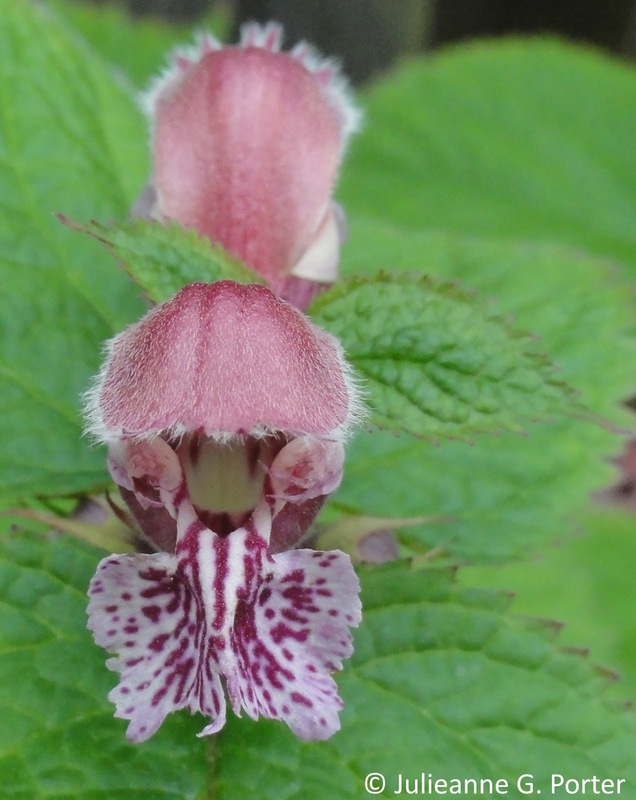 Lamium orvala. You can spy a couple of Sarcococca leaves to the left. 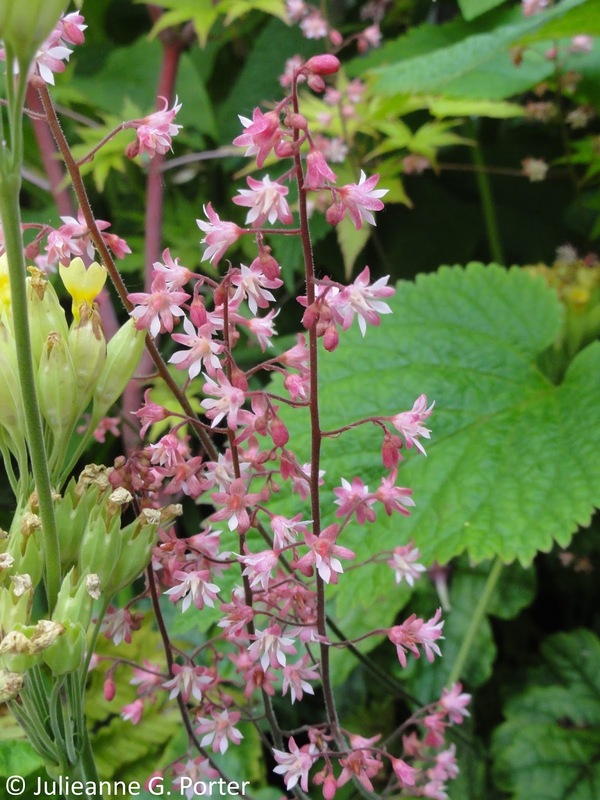 And I love the starry flowers of Heucherella 'Tapestry'. 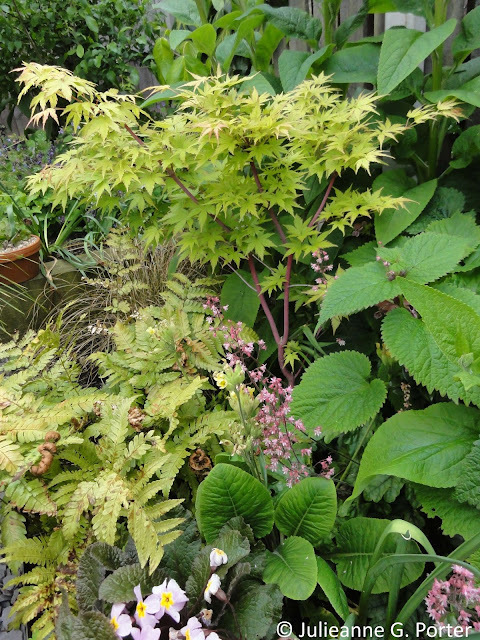 In fact I think this, the Lamium and Acer, and along with the fern Dryopteris erythrosora, all go rather well together. 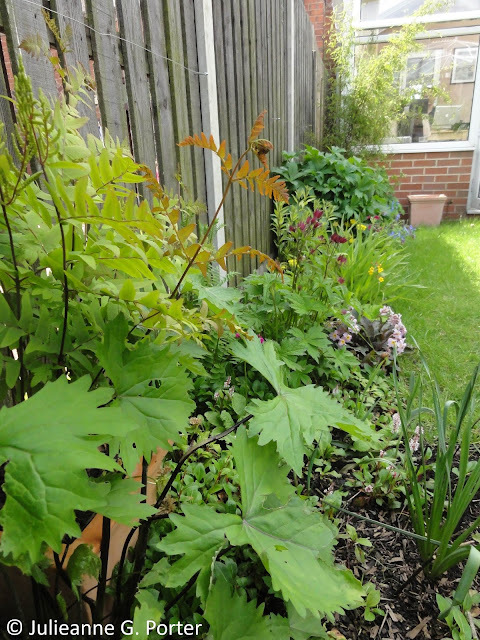 They just need a bit more space, so I need to think about how I can edit this part of the border to give the plants some breathing room whilst retaining the lush feel. Looking from the middle of the border back up to the Damson, the Morello Cherry, being trained on wires along the fence, is now in full leaf and the blossom of April has become tiny cherries. Can you see the two Epimediums under the Acer? 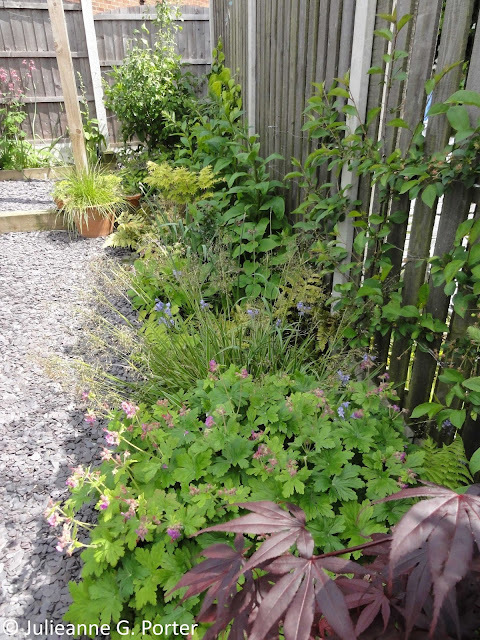 Between the Geranium and the Melica? Of course you can't, as these plants have totally over grown them! I've decided I need to rescue the poor things and move them elsewhere so they can have their place in the, well, shade. This will be a job for June. 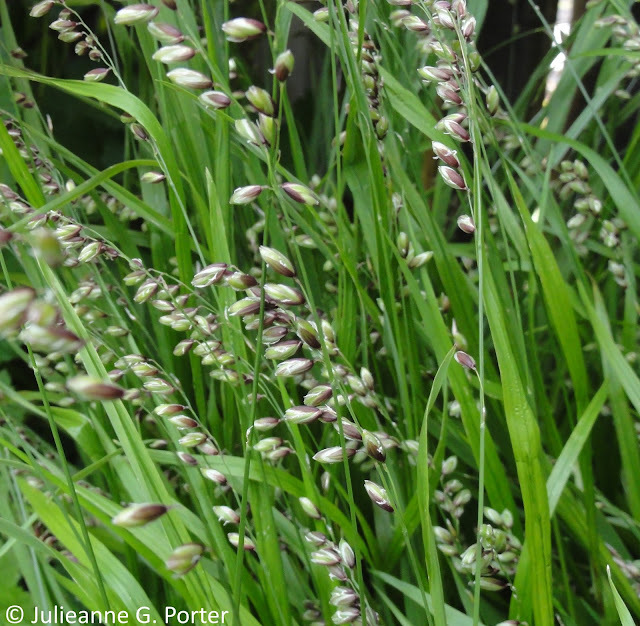 What you can see under the crimson Acer, Acer palmatum 'Bloodgood', is a small grass Melica nutans, with delightful brown-cream flower panicles which rustle in the wind. 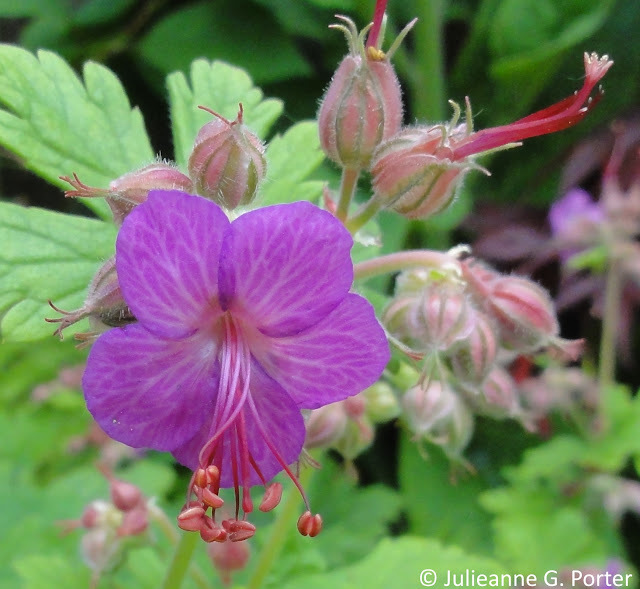 After not growing much nor flowering at all last year, Geranium macrorrhizum 'Czakor' has filled out and has produced lots of flowers. Happy in shade and happy being picked for cut flowers; they lasted two weeks in my vase in the lounge room. The Bluebells have been flowering, but I'm slightly confused as to their variety. 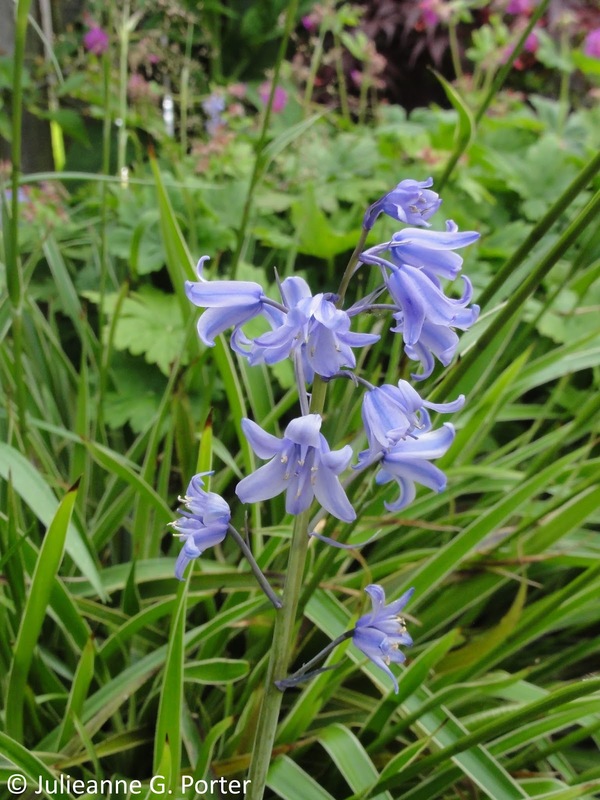 They are meant to be Hyacinthoides non-scripta, the English bluebell, but rather than leaning over to one side as they should, they are flowering all around the stem, like a Spanish bluebell. They do still have the fragrance, which the Spanish don't, and they didn't do this last year. I got the bulbs from Peter Nyssen, who are very reputable and I've never had any problems with bulbs from them. There are no Spanish bluebells nearby, neither in my garden or nearby ones, so I'm curious to know why they looked like English bluebells last year, but have changed to look like Spanish bluebells this year! I've emailed Peter Nyssen to see if they can put some light on the matter. I'll let you know what they say. But if you have any ideas that could clear up this mystery, do let me know. From the conservatory end of the Long Shady Border there has been lots of growth since the end of April. The above photo makes the conservatory end look quite lush, but as I mentioned last month, it's still quite sparse compared to the other end of the border as you can see below. Thanks to readers who offered suggestions last month of what I might add that will give height and that doesn't mind being wet, those being: Photinia Red Robin from Angie (like me she isn't keen on it but it does survive being wet), Leucothoe fontanesiana from Juliet, Cornus from Home Slip, which to my surprise don't mind being wet, and Sorbus aucuparia from Helene. Of these, I quite like the idea of the Cornus, particularly as it would add much needed winter interest, or the Sorbus which would add height, but I'm still dithering over the decision-making! 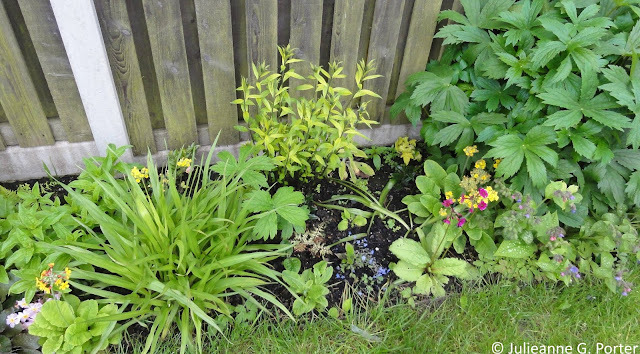 Whatever I decide, I'll have to do quite a bit of editing in the area around the plants above, which include the Tradescantia Andersoniana with the grass like leaves, and Amsonia tabernaemontana with the yellow-green leaves next to the fence. And therein lies the reason for my dithering. The ME is much worse at the moment and I'm reluctant to add more gardening tasks to my already long list. The rest of the garden beyond the Long Shady Border also demands my attention. Rearranging a whole section of a border, even a small area like this, is a lot of work. 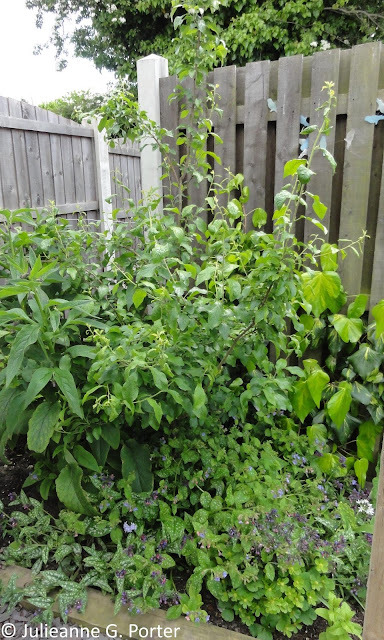 And as you saw earlier, I have to sort out the crowded plants up the other end of the border. Hopefully when I've improved I'll be able to make a decision, and have the energy to carry it out. I wasn't expecting their flowers for a few more weeks, but hey, not complaining! There are a few of each planted in the Bog Garden area, plus thanks to a reminder from Helen, I've also managed to purchase and plant out Iris siberica 'Silver Edge' which should also flower in June. The Bog Garden, with the leaves of Ligularia 'The Rocket' making their dramatic appearance. To the right are the leaves of the new Iris. 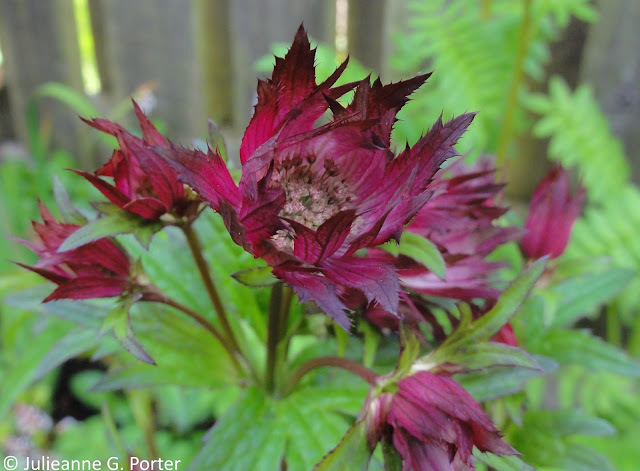 My current favourites in the bog garden now are the stunning flowers of Astrantia major 'Hapsden Blood'. 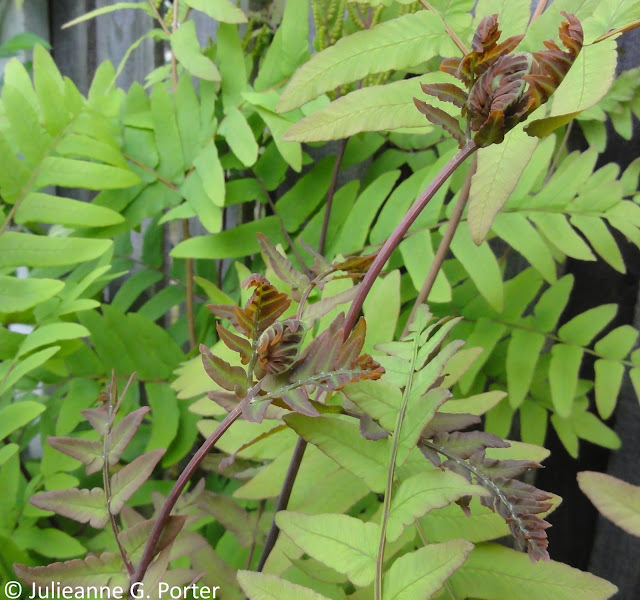 And the beautiful leaves of Osmunda regalis 'Purpurascens'. 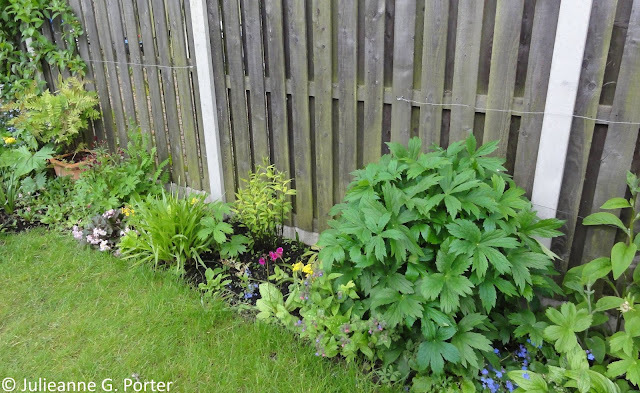 On the whole, whilst there is still work to be done, the Long Shady Border gave both Kevin and I lots of pleasure in May. I look forward to seeing what it does in June. See you then. End of month view is hosted by Helen Johnstone, aka @patientgardener. 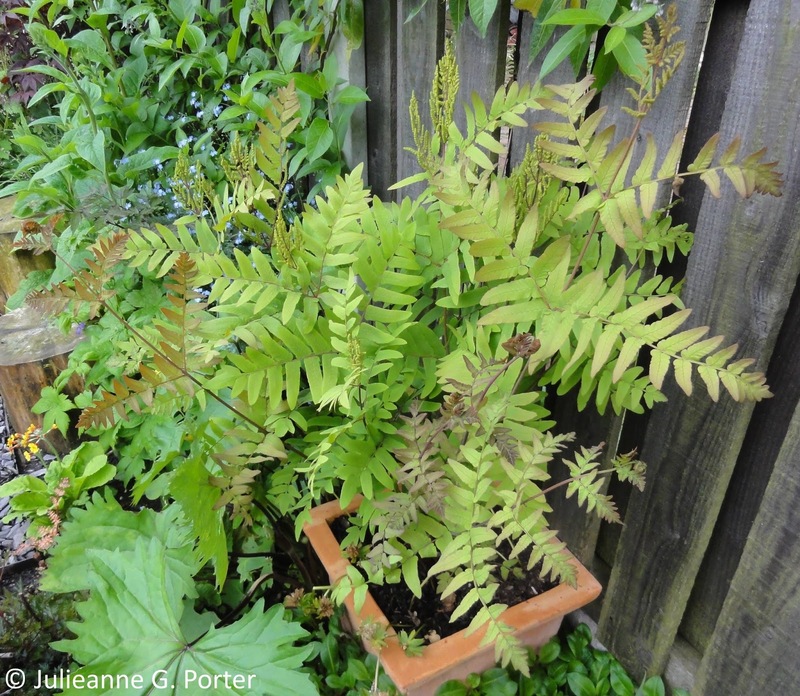 Visit Helen's blog for her May 2015 EOMV and links to other bloggers EOMV posts. Lots of favourites here. I was especially interested in all your bog garden plants which are all looking lovely. 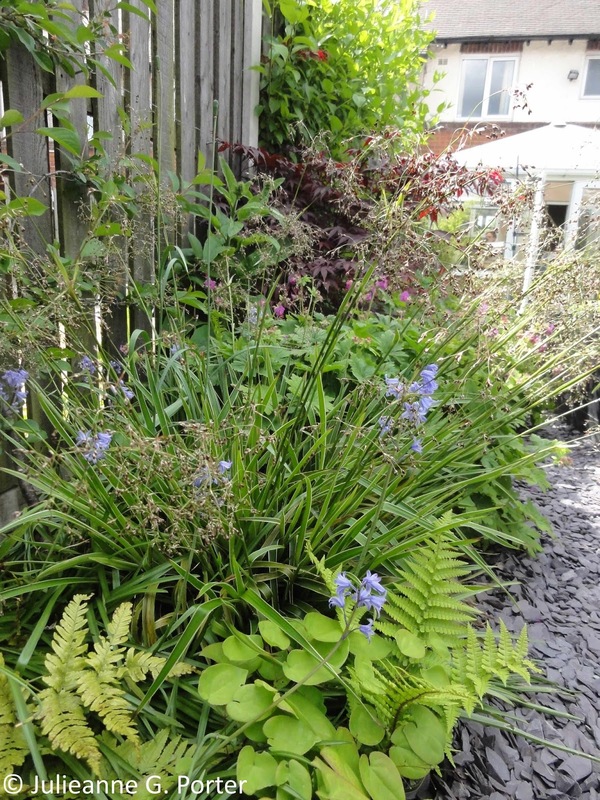 I was wondering if you could cut into your lawn to give your borders more depth and space for plants? I have briefly thought about digging up more of the lawn in the past. At the moment that would make it an even bigger job and I don't have the health to do so sadly. Maybe I'll have to save my pennies and pay someone to do the digging etc. Mmmmm. Thanks Helen. That's a good point about the Bluebells, and I have noticed that already. I'll keep an eye on them. First of all, I can't get over how much everything has filled out Julieanne, amazing. It all looks wonderfully healthy. You are cursed with the over planting bug too I see. I find that a couple of my Epimediums are totally swamped by a few plants in summer but it doesn't do them any harm and when they die back, the Epimediums do their thing again. Lamium orvala is a favourite of mine too right now. Are you able to widen your borders a wee bit to allow you to continue to grow all these plants together. It might not take much to give them just a bit of extra root room. I didn't know that the Epimediums would survive such overplanting, but I still think I'll move them as I've hardly had a chance to enjoy them before the other thugs took over! At the moment I'm unable to make my borders bigger, I just don't have the energy/health to do so. Thinking of saving up the pennies to pay someone to do the work! 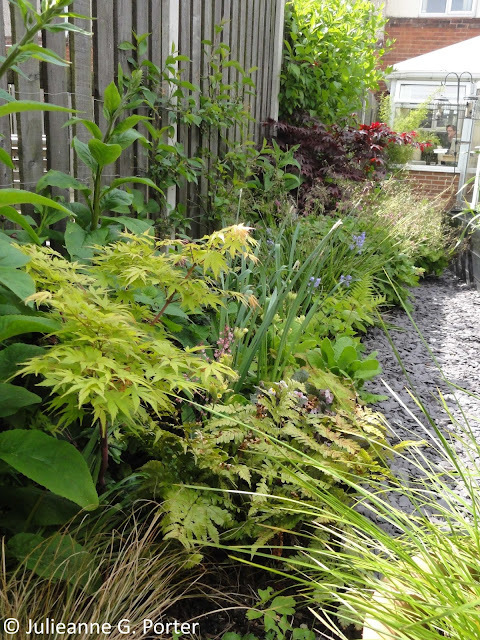 Your shady border and the boggy area are looking fabulous! Everything has filled out so quickly. I have Acer Sango kaku and fell I should mention that it is now 8ft X 8ft! 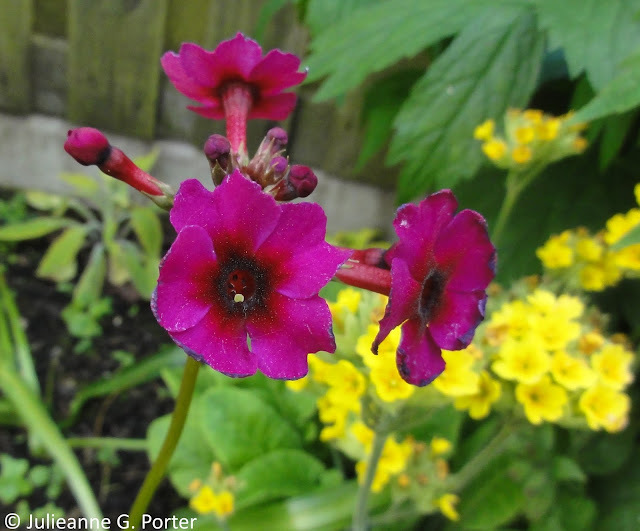 When I replant a border I usually sow some annual seeds to fill the spaces and this usually works. So sorry to hear that your ME is playing up again, do take care of yourself. Oh I've really enjoyed reading your End Of Month View Julieanne and discovering another blogger who obviously loves shady characters. Osmunda regalis 'Purpurascens' is on my wish list :) Hope that you have some joy solving the bluebell mystery. I love the tapestry effect you create in your shady bed and what lovely bog plants. I agree that bluebell does look suspiciously like a Spanish one. I am sorry to hear you struggle with ME, what a curse, specially for a gardener. I hope you get more energy when the warm weather comes. I have been trying to find your ' about' page but I can' t find one. Thanks for your kind comments Chloris. And confirmation that the bluebells don't look English!